It was the capital of pro-consular Asia, being about a mile from the sea coast, and was the great religious, commercial and political center of Asia. It was noteworthy because of two notable structures there. First, the great theatre which had a seating capacity of 50,000 people, and second, the temple of Diana which was one of the seven wonders of the ancient world. It was 342 feet long and 164 feet wide, made of shining marble, supported by a forest of columns 56 feet high, and was 220 years in building. This made it the center of the influence of Diana worship, of which we read in Acts 19:23-41. The statue with its many breasts betokened the fertility of nature. (1) Revisited there on the return from the second missionary journey (Acts 18:18-21). and left with them Aquila and Priscilla. (2) On the third missionary journey he spent about three years there, (Acts 20:31). (3) During this second visit he had such influence as to check the worship of Diana to such an extent as to arouse the opposition of her worshippers and make it necessary for him to depart into Macedonia (Acts 20:1). (4) On the return from the third missionary journey he stopped at Miletus, thirty miles away, and sent for the elders of Ephesus to whom he delivered a farewell address (Acts 20:16-38). The contents are much like to those of Colossians, but also differ greatly from them. (1) In each book half is doctrinal and half practical. (2) Colossians discusses Christ-hood or Christ the head of the church, while Ephesians discusses church-hood or the church as the body of Christ. (3) In Colossians Christ is "All and in all", in Ephesians the ascended Christ is seen in his church. (4) In Colossians we have Paul in the heated arena of controversy; in Ephesians he is quietly meditating upon a great theme. By Paul, probably from Rome, A. D. 62 or 63. The church, Christ's mystical body. 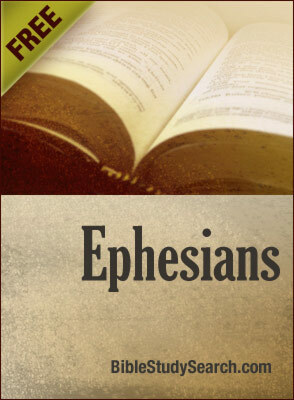 Study and Discussion Questions on Book of Ephesians. (1) The Christian's standing before God, Chs. 1-2. Such words as sealed, chosen, quickened. (2) The blessings of the church, make a list, 1:3-14. (3) The elements and characteristics of the new life, 4:25-32. (4) The different things done in an intelligent Christian life, 5:3-17. (5) The exalted nature and office of Christ, 1:2-33; 2:13-22. (6) The eternal purpose of God, 2:3-5; 2:4-7; 3:9-12. (7) Principles of Christian sociology seen in the home relations such as husband and wife, child and parents, and servant and master. (8) The Christian's relation to Christ as seen in these relations.